At first glance it appears that the artist has depicted a normal city street, a typical rue-corridor, but if you look more carefully you soon discover that the buildings are all connected with each other, that there are no vertical meeting lines or joints that separate the buildings (properties) along the street. For a moment the varying roofscape has fooled the eye. What at first glance appears to be different buildings, with a different roof on each building, turns out to be one-single-roof on just-one-building. This is not what a street in an older city district looks like. It is simply—wrong. The artist does not understand how cities come about, how they grow and change over time. He does not understand how urbanity works. • Inner property lines (property linesinner), between an individual property and another individual property. Requires no large investments beyond perhaps boundary markings like fences or walls. Inner property lines are cheap. • Outer property lines (property linesouter), between an individual property and the street/public space. Requires large investments in infrastructure (electricity, water, sewer) and maintenance (snow removal) along the street. Outer property lines are expensive. The total length of the inner property lines of one or several city blocks, divided by the total length of the outer property lines of the same block or blocks (∑property linesinner / ∑property linesouter), that ratio, that relation is what I call the Urbanity Index—which I shorten to u. 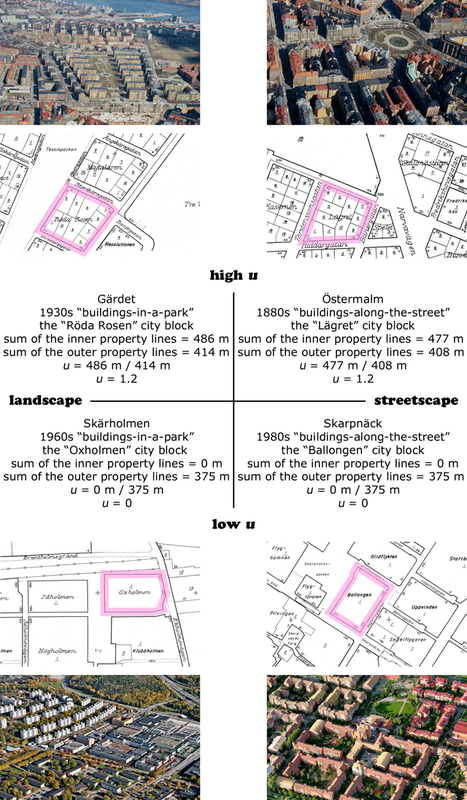 The planning examples from Östermalm and Skarpnäck, in the two quadrants on the right, are noticeably similar to each other in regards to their architectural form and their manner of arrangement (“buildings-along-the-street”), but Östermalm (high u) is experienced as much more “urban” than Skarpnäck (low u). The planning examples from Gärdet and Skärholmen, in the two quadrants on the left, are also noticeably similar to each other in regards to their architectural form and their manner of arrangement (“buildings-in-a-park”), but Skärholmen (low u) is not at all experienced as “urban” as Gärdet (high u). The difference in the Urbanity Index between, on the one hand, planning examples from Östermalm and Gärdet (high u), and on the other hand planning examples from Skärholmen and Skarpnäck (low u), correspond well with the differences in the experience of urbanity. A classification based on “buildings-along-the-street” and “buildings-in-a-park” has nothing to do with classifying according to a felt urban experience. The Urbanity Index u in this way says more about these four planning areas’ urban qualities than what their architectural forms, styles, or planning arrangements do. In the 1930s the building industry was still dominated by an 1880s planning approach based on small production units, which at Gärdet resulted in properties that were just as small as those of fifty years earlier built along the street corridors of Östermalm. As a result, Gärdet (“buildings-in-a-park”) has an equally high u as Östermalm (“buildings-along-the-street”). In the 1980s the building industry was still dominated by a 1960s planning approach based on large production units, which in Skarpnäck resulted in properties that were as large as the long building slabs in Skärholmen from thirty years earlier. 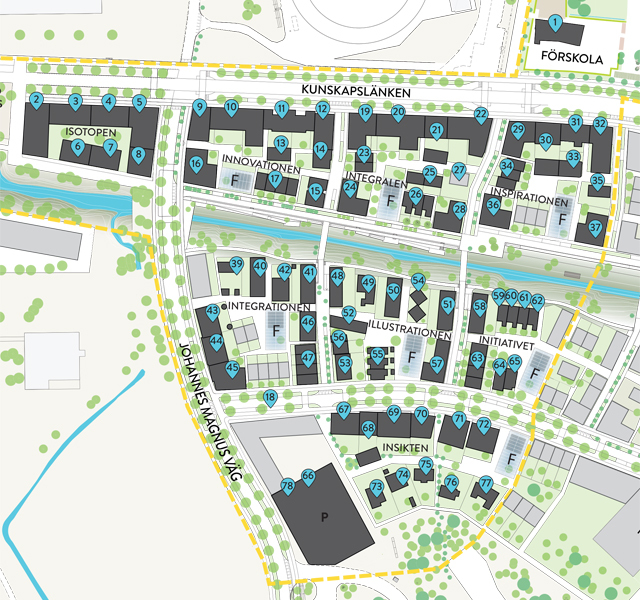 So Skarpnäck (“buildings-along-the-street”) has an equally low u as Skärholmen (“buildings-in-a-park”). The classification of planning examples according to the Urbanity Index, with Östermalm and Gärdet in one group (high u) and Skärholmen and Skarpnäck in the other (low u), corresponds well with very important socio-economical changes in our city planning history. But since all four examples have more or less equal levels of density with more or less equal floor area ratio levels, the floor area ratio FAR cannot be used to make this kind of classification. For this reason FAR cannot be used to measure the differences between the planning examples in regards to the experience of urbanity. The Urbanity Index u therefore tells us more about the urban character of these four examples than what the floor area ratio FAR can do. But is it a pure coincidence that both of the low-u examples (Skärholmen and Skarpnäck) are located on the outskirts of the city, while both of the high-u examples (Östermalm and Gärdet) are in the center? Are not the differences in the experience of urbanity in these four examples actually more about the center-periphery dichotomy? Not really. There are plenty of areas on the periphery with very high u-index values and with much more ”urbanity” than both Skärholmen and Skarpnäck. I am referring of course to single-family housing areas. “But in these areas there is no street life to speak of, with large spaces between the houses, and no shops and restaurants—areas of this kind are about as far away from the notion of urbanity as one can get!” somebody will protest. Which shows that the Urbanity Index u may often give a measured result that at first glance seems counterintuitive. Like when a bleak, empty field in the middle of nowhere is classified in a u-index calculation as a highly urban place, long before the arrival of any streets or any buildings—as long as there is a property division, as long as there is a plot map. If the reliability of the u-index as a measure of urbanity is accepted—as indeed it should be—then urbanity has arisen at the same moment when property boundaries were established. The buying and selling of unbuilt lots and properties is classified in the long run as an urban practice of the highest degree. Which is fully reasonable, is it not, upon further reflection. Suburban real estate and inner city real estate are part of the same economy, and are bought and sold in the same market. In spite of the inherent difference in lifestyles between the two, both single-family housing areas (with high u) and inner-city urban blocks (with high u) are an expression of one-and-the-same urbanity. And in the case where the u-index value for the sleepy (at the moment) single-family housing area is very high, this high u-index value also becomes a prediction and half promise of a possible “hyper-urban” future, in which the area eventually gets denser, and commercial, cultural and entertainment development appears (which aligns more closely with our most common intuitive understanding of the term urbanity). Many busy, crowded “hyper-urban” areas were originally rural faubourgs located on the outskirts of the city.2 And the likelihood that a sparsely populated single-family housing area with high u will develop this kind of hyper-urbanity over time is much greater than what an already densely populated high-rise suburban area with low u ever will. The main difference in the experience of urbanity between the two high-u examples and the two low-u examples mentioned above is not principally about the center-periphery dichotomy. Low-u areas tend to be located on the periphery of the city simply because they are the youngest areas, because the city center was already completed at the time when housing areas with low u began to be built systematically. And these outer suburban areas with low u lose out not only when compared to inner city areas with high u, they also lose out when compared to city-block planning in outer areas with high u. In this respect the Urbanity Index u tells us more about how urbanity arises and is developed, both in and around our cities, more than even the center-periphery dichotomy does. The Urbanity Index is in any case extremely high (u = 1.2) for the examples from Östermalm and Gärdet, but individual larger lots located here and there among the smaller lots makes u for Östermalm and Gärdet on the whole somewhat lower (u ≈ 1). The Urbanity Index is extremely low (u = 0) for the examples from Skärholmen and Skarpnäck, but individual blocks located here and there that have been divided into at least two separate properties makes u for Skärholmen or Skarpnäck on the whole not quite zero (u ≈ 0). Most of the blocks in both of the suburban examples with low u (Skärholmen and Skarpnäck) consist of one single property. 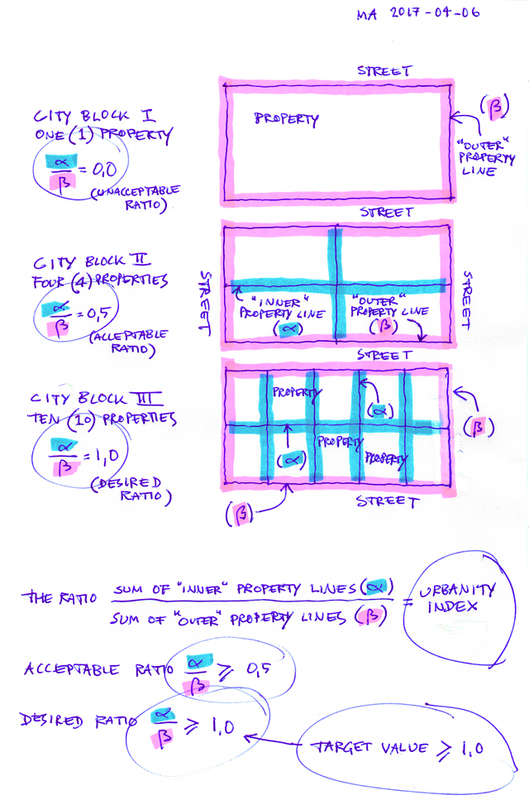 And when the properties are as large as a city block, when a city block = one property, u is always zero (since the sum of the inner lot boundaries = 0). In the special case of u = 0 we have as a result “zero urbanity”—one could state this simply, rhetorically, polemically, and didactically. At this point—despite some results that at first glance may appear counterintuitive—you will have realized that there is a very strong and clear connection between the Urbanity Index and the urban experience. Urban areas with high u tend to work better socially, economically and culturally, and are experienced as more lively and dynamic than urban areas with low u. The truly important dividing line in the urban experience (socially, economically, culturally) runs neither between “buildings-along-the-street” and “buildings-in-a-park” or between low and high floor area ratios or even between center and periphery—the really important dividing line goes between a high and a low u. And since the Urbanity Index u reveals the big important socio-economic changes in our city planning history, it tells us more about how urbanity functions than what architectural form or degrees of floor area ratios or the center-periphery dichotomy are able to do. The Urbanity Index u in this respect provides us with a reliable and unbeatable measure of urbanity. 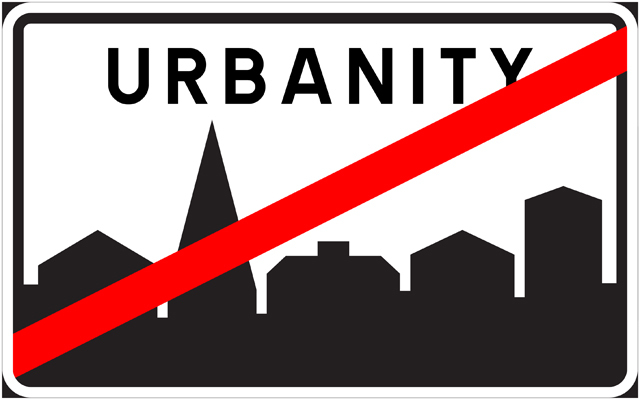 As a result the notion of urbanity may therefore be defined as a certain Urbanity Index u, which may be proposed as u ≥ 1. You can start calculating your own Urbanity Index values now, and it is easier than you may think: I have found that other more or less arbitrary outer circumstances, like for example the width of the street, need not be accounted for in my calculations in order for the results to be reliable and useful. I also usually disregard “holes” in the city block structure (parks, schools, and other large institutional buildings). Nor have I found that when I calculate the Urbanity Index that I need to account for the possibility of urban “contagion” between areas with differing u-index values that happen to be physically near each other. My evidence for this is anecdotal, I admit this, but a short physical distance to a city block with an Urbanity Index different than your own seems in the long run to have little to do with how a given city block will develop over time. A high-u city block, according to my calculations, may keep its high u-index value even if there is a low-u area close by, and a low-u area may keep its low u-index value even if the closest neighbor has a high u. As a result, determining the limits of the area to be measured does not have to be complicated at all. On the other hand it is not always obvious how a given property line within the area of measurement should be classified. Dividing a city’s lot and property lines into only two categories (“inner”/“outer”) is, as been mentioned, a simplification, and when measuring and calculating u-index values one will always be faced with hybrids, especially with newer buildings. Nowadays it is common to have building developments whose property lines can neither be classified as clearly inner nor clearly outer. So how to deal with this? How do you calculate the Urbanity Index in ambiguous cases? Even in these cases I have found that I can make it very simple for myself. I actually do not factor in lot and property hybrids at all when I calculate a u. For example, the boundary between two row house properties (with private yards) need not reasonably be considered as a clear-cut inner lot line if both row house owners also own shares of common areas (like surrounding common land) within the same development. The division into “private” row house properties appears in such cases to be fluid and not at all as definitive as one would expect in an area with high u. The boundary between a “private” row house property and a common area within a row house development cannot reasonably be considered to be a proper outer lot line. In the end there is only the outer boundary to be calculated, the outer boundary toward the street, which for a block-size row house development with common areas gives a very low u value (u = 0). For the u-index, the boundaries between private yards in a row house development containing common areas are inconsequential. They are comparable to party walls between different apartments in a housing cooperative. It is the boundaries between properties (between different housing cooperatives) and not the boundaries between individual apartments within the same property (within the same housing cooperative) that are of significance when calculating the u-index. Which is also the case with the many rental properties in Stockholm’s low-u suburbs that in recent years have been transformed into housing cooperatives. Many are disturbed by this trend, not least because the newly formed cooperatives began to build fences and gates in suburban environments that had been open and without fences for a long time, new fences and gates that are seen as denigrating, a distortion of previous architect generations’ visions of idyllic suburban living in delicate greenery, where neighborhood communities flourish without discernable property lines. Others are more positive to change, and see the transformation to housing cooperatives as the beginning of a more dynamic development in low-u areas where very little otherwise happens. The lack of clearly marked property boundaries, by the way, has always been more a source of irritation than an asset for those who in these fenceless suburban landscapes are constantly in conflict with neighbors one must share “semi-private zones” with. Good fences make good neighbors. Of course your newly formed housing cooperative shall erect an ugly fence. Of course you do not want me to allow my dog do its business in your backyard, especially if it now really is your backyard. But at the same time remember that for a genuine urban milieu to develop, these new fences in and of themselves, and these transformations of rental units to housing cooperatives in and of themselves change nothing in the long run—not as long as the properties are still as big (city block big!) and the u-index values are just as low. I toy with the idea of having the Urbanity Index written into law. If say a u ≥ 1 was required for new construction, in the same way that elevator and fire safety has for many years been required by building codes, it would soon be apparent that the long-term socio-economic benefits of a property division requirement would be absolutely comparable with the long-term socio-economic benefits of elevator and fire safety requirements. I imagine that after the passing of such a law that Sweden’s municipalities could continue to plan entire housing areas all at once, that architects could continue to design entire housing areas all at once, that developers could continue to build entire housing areas all at once, and that the entire housing area could have one and the same owner. But the property owner in question would eventually sell off some of the large-scale project’s many individual buildings—which is easily done due to the required divisions of the project into smaller properties during the planning stage. The housing properties that are sold would soon begin to live their own lives; they perhaps eventually get renovated, or are demolished. New buildings are constructed on the demolished sites. And over time a large building project that was originally very unified in its appearance begins to show visible signs of the kind of diversity and variation that we normally associate with genuine urbanity. Large-scale hyper-rationalized projects, which are so common in Sweden these days, need not in this respect in and of themselves mean a bad urban prognosis—as long as property owners and developers accept not only elevator and fire security requirements, but also accept requirements for a reasonable Urbanity Index. But how would the political parties regard such a compulsory law? To begin with, how would the right see it? Actually very favorably, I would imagine. Planning areas with very high u-index values (u ≈ 1) have historically appeared “naturally” only in plutocracies, i.e., in social economies with great respect for private property, in political systems where political power in the city resides with the capitally strong, property-owning, building-constructing bourgeoisie. With the introduction of universal suffrage some one hundred years ago, the non-property-owning, non-building-constructing great masses in Sweden also acquired actual power over the city’s properties and buildings. Since then, private ownership rights must often yield to majority decisions in democratically elected assemblies dominated by non-property-owning, non-building-constructing representatives. Since then, we all live in a post-urban era. Buildings are no longer regulated by individual property owners, in their own interest; they are regulated ultimately by the great masses, in the interest of the great masses. The spatially effective and explosively dynamic but at the same time socially ruthless urbanity of not only Oliver Twist’s London and Les Misérables’ Paris but also Strindberg’s Stockholm has all but disappeared—in keeping with the establishment of a more democratic playing field for city planning and housing construction. Which has also meant that high Urbanity Index values have been systematically replaced with low Urbanity Index values. All u-index calculations in fact predict the same kind of meager urbanity for our very latest large-scale housing areas as they do for historical examples like Skarpnäck or Skärholmen, since the Urbanity Index values are still always so low when we build today. Truly high Urbanity Index values do not arise (i.e. not any longer) by themselves. If the right in the future wishes to see more and larger property developments in a traditionally bourgeois, plutocratic (or at least semi-plutocratic) fashion, then this type of development must be made compulsory. For this reason, I would imagine, the right would welcome a law on the Urbanity Index with open arms. So what about the left? How would the left regard a law that requires everyone to build, um, in a bourgeois manner? Actually very favorably, I would also imagine—if (I say if) it really becomes a question of required. Isaiah Berlin noted that the left is strongly affected by Jean-Jacques Rousseau’s vision about how the general will (la volonté generale) shall force (!) citizens to be free (forcer les citoyens à être libres). Since it seems to me that Isaiah Berlin was right in his analysis of the right’s and the left’s concept of freedom,3 I imagine that the left should be attracted to an urbanity that is no longer determined by market forces, that is no longer a component of a distasteful (for the left) free market economy, attracted to an urbanity in which citizens actually do not choose but rather are forced to enjoy all of the social, economic and cultural freedoms that an urban lifestyle offers, attracted to the thought of an urbanity as an expression of the Rousseauian forcing by the general will, even attracted to forcing-for-the-sake-of-forcing. A true democrat eschews urbanity, eschews a plutocracy’s uninhibited ruthless, unbridled urbanity, but the new kind of democratic, semi-plutocratic, restricted, contained, forced urbanity that I am proposing here, I would imagine, is not only politically possible, it is actually a desirable solution to many urban planning problems—for both the right’s and the left’s true democrats. So whether you are on the right or on the left, say Yes! to being forced, ennoble unto liberty this constraint,4 and with that—Abracadabra! Simple! The Circle is squared! Ta-dah! 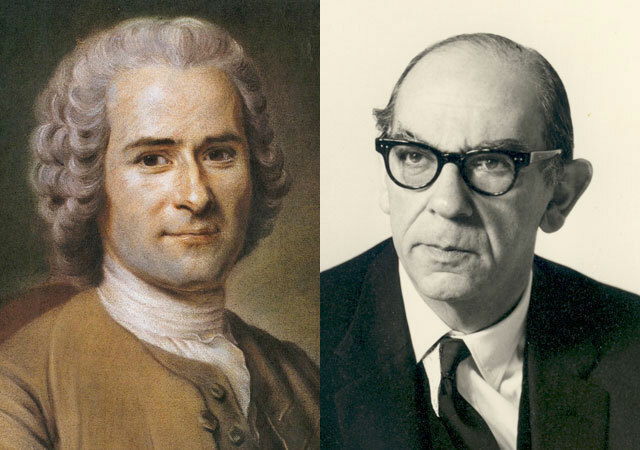 Isaiah Berlin and Jean-Jacques Rousseau stand side by side; two very different political ideals (“negative freedom” and “positive freedom”) are united into a productive and mutually loyal collaboration in the city, united by a compulsory legislation on the Urbanity Index. 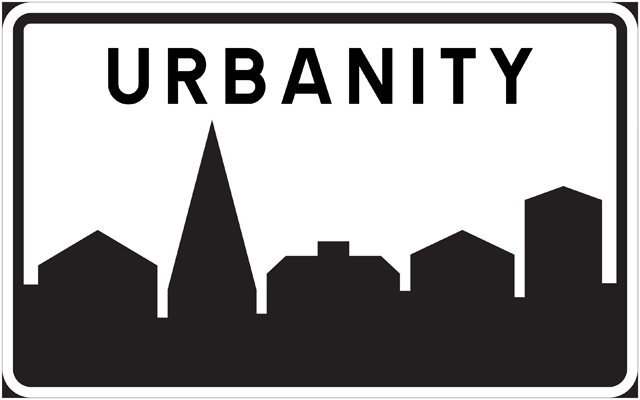 The urbanity definition u ≥ 1 will hopefully get you to think once or twice in the future before deciding to combine several small properties into one new block-size property. The urbanity definition u ≥ 1 explains why certain kinds of tax-funded investments in urban development (“renewal”) fail to give the social or economical or cultural results that politicians hope for (low u), while in other places urban development takes off on its own without any outside assistance (high u). 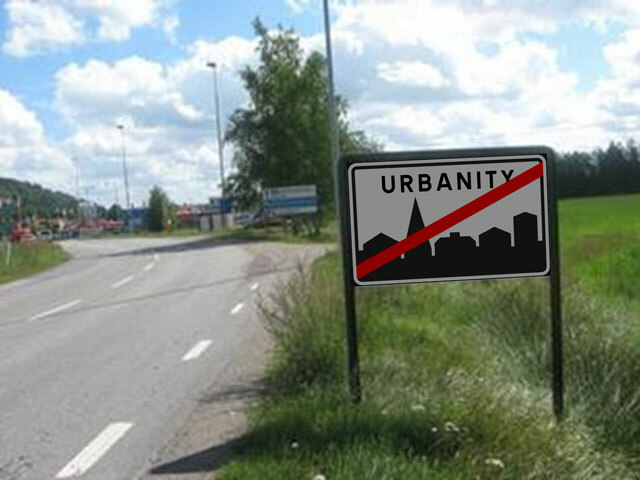 The urbanity definition u ≥ 1 teaches us that it is best to avoid the over-used descriptions “suburb-like” and “city-like,” as we are inclined to do in Sweden. Of course one uses “suburb-like” as a judgment about only a certain type of suburb, namely the kind of suburb that we—because of the Urbanity Index—can instead simply begin calling a low-u-area; and of course one uses “city-like” as a judgment about only a certain type of inner city area, namely the kind of inner city area that we instead can begin calling a high-u-area. But an inner city area with low u is also in the inner city, and a suburban area with high u is also in a suburb. There are suburbs that feel urban, and there are inner city areas that are completely lacking in urban qualities.5 So even if there often exists a really good reason to talk about urban problems in terms of center-vs.-periphery, one must also, if it is the issue of urbanity one wishes to address, make a distinction between center and center, and between periphery and periphery—in other words: make a distinction between a high and a low u. The reliability of the Urbanity Index as a measure of urbanity must of course be tested, checked, and proven with a larger sample of examples than what has been discussed here. Both my urbanity formula (u ≥ 1) and my way of calculating property line hybrids (not at all!) might need to be adjusted in the future.6 But until then: Urbanity-can-be-defined-as-an-Urbanity-Index-value-that-is-greater-than-or-equal-to-one. This is and will remain a very reliable, practical and in every possible way excellent rule of thumb. Well now I have looked rather closely at the plan for Vallastaden (with that insistent suffix, “-staden” [city]).7 I have some thoughts about how the u-index should be calculated in Vallastaden, but first a little summary of my impressions. Even if an uncommonly far-ranging comprehensive plan has been developed for Vallastaden before land allocation and land development agreements have been signed, the plan is basically a product of exactly the same kind of architectural thinking that has already given us Ville Radieuse, Radburn, Farsta, Skarpnäck, and Annedal – the same kind of grand composition with social and architectural pretensions. When Farsta was planned, the point of departure (somewhat simplified) was that people will feel well if there are trees outside of their windows and there is a parking lot, now the point of departure is that they will feel well if buildings are placed in lively streets with varied roof heights and outdoor cafes. And the latest is that people also need “small building plots” to feel really, really well, which is the typical perspective of architects. Every block will have a more closed, urban-like outside, while the inside of the block can be more spatially loosened up, but still with buildings placed along the pedestrian paths that go through the blocks. Along the street there are openings in at least one or two places that lead to the courtyards. Along the bicycle paths and pedestrian paths the building heights vary from 1 to 6 stories, and in many cases the buildings have small gardens towards the streets. To ensure the desired variation in building heights, the number of floors for multi-family housing is specified for many sites. The blocks are divided into a number of narrower “farm strip” plots, which creates a small-scale subdivision. The content of the plots and the scale of the buildings vary, both between and within the blocks. Within each property the ambition is for the neighbors to share a “winter garden” that functions as a half-private zone. This creates the possibility for meetings between neighbors and makes possible an increase in local gardening. In other words, the thought here is that (exactly as in the 1980s) the urban block is what forms the fundamental building unit, not the individual property. Facing outwards, buildings in the lively street; facing inward, all is varied and loosened up, where neighbors can meet. It sounds exactly like a description of Skarpnäck. Note that they include circulation paths here. The intention in this respect is for the joint facilities to duplicate the function of the streets, just like in all urban housing areas where pedestrian and bicycle paths run parallel to the streets. 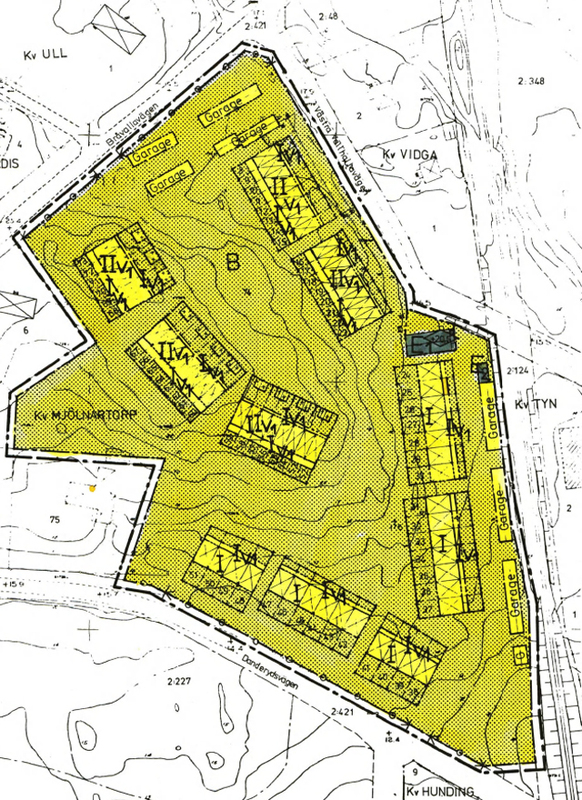 On the detailed development plan map, the land where one can build is limited in a very specific way, with markings indicating where one cannot build at all or where one can build complementary buildings, so that the joint facilities are formed to create a row of small picturesque “alleyways” on the land within the block. South of Smedstadsbäcken there is no street, only a pedestrian way, so most of the properties there (if they shall be as small as they are on the illustration plan) will be served from the joint facility in the block. These properties therefore have no possibility to function as stand-alone units independent of each other and the joint facility – that possibility is eliminated in the plan. Since the joint facility in its conception and in the planning provisions is to be equated with a service street, the border between private properties and joint facilities should be viewed as an outer property line. If one calculates based on this, I would guess that the u-value for the illustration plan (in the detailed development plan the exact locations of the property lines are not shown) would end up at around 0.25 or lower, despite very small plot sizes. To summarize: Vallastaden is just the latest expression of the same architectural thinking as usual (“Same old thing in a brand new drag,” as Bowie formulated it in Teenage Wildlife). Those who developed the plan see “small plots” as something decorative, which at the same time supports well-being and a sense of community within the local block. There is no – no! – understanding of how properties function and what they can and cannot do, neither in relation to city planning, urban life, property finance, nor social economics (a good starting point is found in the introduction to Sweden’s Code of Land Laws: “Real estate is land,” if I remember correctly). The plan for Vallastaden is completely architecturalized, the exact opposite of for example the simple and clear exemplary plan for the expansion of Santa Maria on Cape Verde. The conclusion is therefore the same as in so many previous instances: most architects should not be doing city planning, because they do not understand the difference between land use and building. The only thing they can produce is architecture, and when a sensible answer to a question cannot be formulated in architectural terms, they stubbornly reformulate the question and the conditions so that they can do exactly what they usually do. Hello, I have allowed myself the freedom to sketch out a definition of urbanity, just to show approximately what I mean. It need not be accepted, but should instead be seen only as an illustration of how it could look. My point is that a measurement of urbanity’s physical expression through property lines must also have an equivalent definition of what social effects this contributes to. People exist and grow in close connection with the physical environment, which they continually shape and adapt in order to achieve their goals (can be supported by anthropology). The physical environment is thereby a form of technology whereby individuals give direction and seek out support for their own development. By extension, this means that the diverse social forms that human beings have established and maintained throughout history have always been supported by the physical environment. The various patterns of building development we can identify throughout history have thereby not only a technological basis that involves rationally solving everyday problems, but also represents to the same degree various social ideals, where the physical environment through its spatial structure defines, sorts, and places social groups into specific relations with each other in accordance with these ideals. All social systems are characterized by two basic relations: the relation between private interests, and the relation between private interests and common interests (can be supported by sociology). From Supposition 1 we can conclude that all complex patterns of building created by human beings, like for example cities, must deal with these two relations. This happens through the establishment of two categories of physical space: 1) a series of spaces where private interests can exist and develop relatively undisturbed by other private interests, and 2) a space where common interests can be manifested. The first category of space has the function of establishing and protecting differences in society, while the second category has the task of identifying and providing space for similarities. The relation between how much any given form of society is ready to invest in spaces for individual interests and spaces for common interests is reflected in the degree to which it sees society as a product of the actions of individuals or the individual as a product of society (a new statement). Supposition 2 suggests that cities that provide large amounts of space for many private interests and significantly less for common interests have a stronger belief in individuals and their ability to solve their personal situations, and only sees a limited part of society comprised of common interests – something we recognize from the social ideal we usually describe as liberalism. On the other hand, cities that provide large amounts of space for common interests and significantly less for various individual interests regard the individual as relatively weak, and someone who comes into his or her own only within a larger community – something we recognize from the social ideal we usually call socialism. Cities are clear examples of Supposition 1, where certain building forms are said to be the bearers of specific social ideals. In general terms, cities stand out from other patterns of building through their unusually high levels of density, which makes possible unusually high levels of proximity between people. The social effect of this spatial characteristic is that it makes possible a high level of differentiation between individuals, for example through specialization and division of labor, since the proximity that the city as a spatial artifact offers recreates the social wholeness that this differentiation risks tearing apart. This socio-spatial duality of great physical proximity and social differentiation is what we usually describe as urbanity (can be supported for example by the theories of sociologist Emile Durkheim). In this respect, urbanity is a socio-spatial concept that describes how certain physical patterns of building contribute to certain social situations that are characterized by great proximity and a high level of differentiation between people. Within this framework, however, there is room for variation. Some cities tend to favor spaces for individual interests while other cities favor spaces for common interests; perhaps more accurately one could say that cities at different periods in history with their specific forms of society at times tend to favor one, at times tend to favor the other. But we can also conclude that there is a limit to how much a city can favor one at the expense of the other before it loses its urban character. Where that limit lies is an empirical question, and to answer it one needs a measurement whereby one can measure urbanity according to the definition above. Such a measurement could be based on the spaces we discussed above for private versus common interests. Such spaces are often established in the form of property divisions, where certain properties are the domain of individual interests and others are the domain of common interests. This division of property gives rise to two categories of boundaries: property lines between different private interests, which is described here as inner property lines (property linesinner), and property lines between private interests and common interests, which are described here as outer property lines (property linesouter). The degree to which any given city favors private interests over common interests, and therefore gives expression to a certain social ideal, would then simply be measured as a ratio between the sum total length of the inner property lines (∑property linesinner) and the sum total length of the outer property lines (∑property linesouter). This ratio could then be described as an Urbanity Index, with the formula: u = ∑property linesinner / ∑property linesouter. Many thanks to Johan Johansson and Lars Marcus for reading through my earlier drafts and for your invaluable comments. • Initial: the Urbanity Index u (typeface Baskerville, italic, lower case). Montage: Mikael Askergren. • Something is not right. 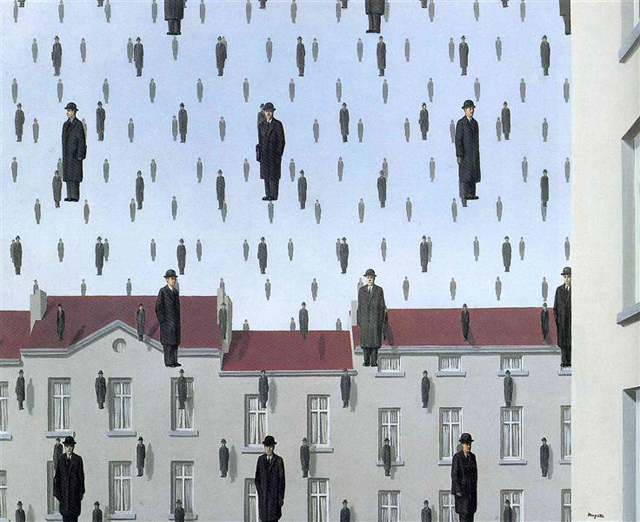 And I am not referring to the weightlessly floating gentlemen in bowler hats. René Magritte: Golconde (1953). • Diagram/freehand sketch by Mikael Askergren. A building development is classified as urban if the ratio ∑property lineinner / ∑property lineouter ≥ 1. • “Lot and Property Hybrids” of the 1960s. Row house development containing common areas (children's playgrounds, private roads, parking, garages). Kv. 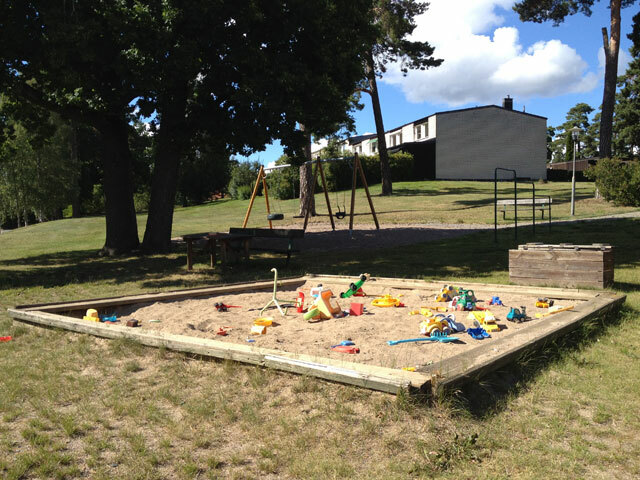 Mjölnartorp (Streetblock “Mjölnartorp”), Djursholm, Sweden. Photo: Mikael Askergren (2016). Site plan from the public archives of the City of Danderyd, Sweden. 1 I first formulated the method for calculating the Urbanity Index u, and the definition of the phenomenon urbanity as u ≥ 1, in March 2016. As far as I can tell there is no precedent to my Urbanity Index: no one who has read earlier drafts of this article has mentioned that they recognized my method or any of my results anywhere else. Note that I write “Urbanity Index” (not “Urbanization Index”) since it is not migration from rural areas to larger cities (“urbanization”) that my “Urbanity Index” measures. Moreover, the Urbanity Index u shall not be confused with “U-value,” the heat transfer coefficient, which measures the insulation effectiveness of a building. 2 Compare Mikael Askergren’s Berlin: enväldets levande och demokratins döda stad (“Berlin: Autocracy’s Living and Democracy’s Dead City”), Arkitektur, Stockholm, no. 2-2011, concerning the Friedrichstadt district’s development from a relatively sleepy rural area (18th century) to hectic “hyper-urbanity” (early 20th century). 3 The right’s “negative freedom” is based on individualism, free will, and the absence of coercion from above. The left’s “positive freedom” on the other hand is defined from above, by the collective, over the individual, which by extension can lead to a situation where an individual who according to the group does not know what “is in his or her own best interest” can be forced to live in a way that the group believes will bring about personal freedom and power over one’s own life. Compare this with a current issue in Sweden, where the ruling Labor Party is proposing an obligatory quota of women on the boards of directors in Swedish companies. Women in the business sector (and on the right) are opposed to obligatory quotas. The left insists on quotas, insist on forcing businesswomen into more equality—for the best interest of those women, to emancipate them, to make them free—as those who advocate “positive freedom” would probably say. 5 Regarding new inner city developments that lack genuine urban qualities, compare Mikael Askergren’s Stadsbyggnad diskuteras (“Urban Planning Discussed”) in the magazine Arkitektur, Stockholm, no. 5-1992, which examines the new housing area Sankt Erik, in the Kungsholmen inner-city area of Stockholm. Urbanity Index calculations did not exist when the area was planned in the 1990s, but I challenge anyone to come up with an Urbanity Index u > 0 for the Sankt Erik area, despite the planning architect’s exaggerated rhetoric with promises of urbanity and pledges to “follow the dense and varied urban pattern” of Stockholm’s inner-city islands. 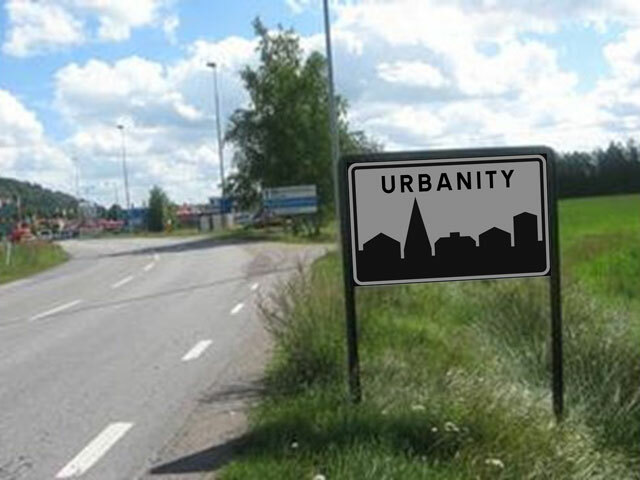 6 Two well-formulated examples of how both the Urbanity Index u and the definition of urbanity itself can be critically examined may be found in both appendices of this article; appendices containing excerpts from e-mail conversations with Johan Johansson and Lars Marcus.